Bethenny Frankel has been on a post-divorce celebration in Las Vegas, but Ramona Singer, ever the loose-lipped pinot-lover, just hinted that her Real Housewives Of New York co-star may have gotten some, um… secret enhancements somewhere along the way! When and what we want to know! First Ramona marvels that this season has been truly nuts. “I don’t think I’ve ever had this much drama in my life – not even with my divorce!” she laughed. Luckily she is there as the problem-solver to help guide these girls through their issues, right? 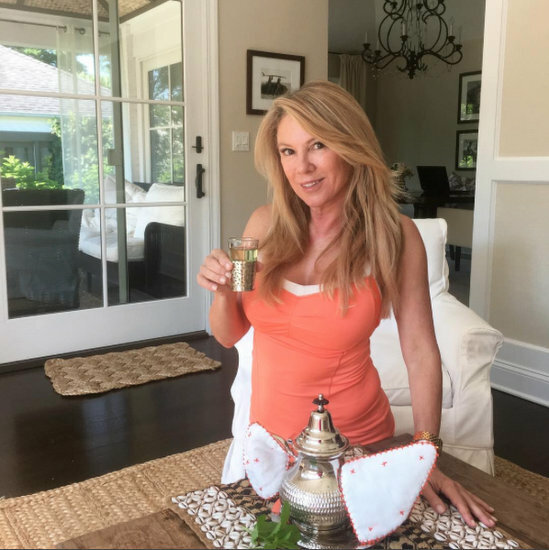 There’s only one thing that matters more to Ramona Singer than pinot – why the Hamptons, of course! You would think after the Real Housewives Of New York star caught her soon-to-be-ex-husband Mario Singer cheating with his much-younger mistress in their 7,000 square-foot Southampton mansion, Ramona wouldn’t want custody of it, but that’s not the case. Ramona Singer In A Bitter Divorce Battle With Mario; Turning To Jill Zarin For Support?! Ramona Singer better not hire Bethenny Frankel‘s divorce attorney because things with her ex-husband Mario Singer are getting nasty! Luckily her old pal Jill Zarin is there to lend a supportive hand to the tabloids. After Ramona caught Mario having an affair (again) the Real Housewives Of New York star filed for divorce, but the exes have been haggling over their houses (their Hamptons home is for rent this summer) and their finances. They have no prenup! Sources say Mario is furious that Ramona kicked him out, retaining residency in their Upper East Side apartment and he is trying to take her to the cleaners! Video – Patti Stanger Was There When Mario Cheated On Ramona Singer! Patti Stanger knows all! The Millionaire Matchmaker has apparently been witness to Ramona Singer‘s husband Mario’s adulterous behavior. Mario was getting very busy in the Hamptons, according to Patti, a close friend of Jill Zarin‘s, who reveals she’s seen Mario on the prowl and chalks up his indiscretions to a mid-life crisis. Last night while appearing on WWHL, Patti was asked about Mario and Ramona’s 20-year marriage, and Patti had a lot to say. Ramona Singer Talks Dating After Divorce; Mario Singer’s Behavior Turned Her Into Someone She’s Not! Ramona Singer is single and officially on the mingle! Since deciding to file for divorce from Mario Singer after years of his infidelities, Ramona has a new lease on life – and love! “I’m definitely out there more – and I’m having fun,” she gushed. The new season of Real Housewives Of New York will chronicle Ramona dealing with divorce, including her painfully coming to terms with Mario’s affair after a 20-year-marriage. Especially since, if you recall, the last time Bethenny Frankel was a Housewife Ramona and Mario renewed their vows to stave off that 17-year itch! Is Bravo Worried That Real Housewives Of New York Season 7 Will Be A Flop? Is Bravo worried that, despite shelling out big bucks on Bethenny Frankel, the upcoming seventh season of Real Housewives Of New York might be boring? Producers are complaining “the season isn’t what they thought it would be,” share insiders. “With the exception of Bethenny, the season is not high drama.” However, Andy Cohen recently tweeted about how exciting this season would be! Ramona Singer is having a tough time since ending her marriage to Mario Singer after a very public cheating scandal, but it seems the exes are both moving on and dating new people. Mario just resurfaced on match.com and Ramona was reportedly spotted leaing Bethenny Frankel‘s birthday party with a much younger hottie (aka, Sonja Morgan made her do it! ).